So you're a new Arashi fan/you want to help your friend getting into Arashi/help other find stuff without being bothered, but it's quite complicated to get yourself around. Search no more my friend because you've come to the right place (without pretention of course!). I'll try not to write too much because it can get overwhelming, but I'll try to concisely list ressources, along with the correct method to search and download stuff (that's the number one request I generally get: "Do you know where I can find XXXXX?"). Without further ado, we'll start with a big zip file with many awesome/must see videos, because videos... are better than words! If you don't know what a pimp post is, basically, in any fandom, a pimp post is a post to introduce an interest or idea to other people in hopes that they will like/follow the interest/idea due to a wealth of information. I made just a quick graphic, because a lot of Arashi subs are color-coded, and when you're new to the fandom, it's easy to get lost (just notice, for the future, that Aiba-chan and Jun's colors are inverted in C/D/G no Arashi and Arashi no Shukudai-kun). You will find many great pimp posts in this entry made by justfever . The Storm x Rainbow x Ridiculousness FB video page, lots of short clips compilation, sometimes subbed, and cute fanvids! As of April 2017, a big part of the international fandom is present mainly on Twitter and Tumblr. for twitter, you can start by checking the list of accounts that I follow here, that will give you a general overview (you can also check who those accounts follow too), and then twitter will give you recommendations later, so you will be able to adjust your timeline according to YOUR taste. Here is a more in-depth tutorial on how to start with twitter. for tumblr, check the Arashi tag, from there, you can see which accounts post often and which one you want to follow. Also checking the tag only will get you up to date informations too. Here is a more in-depth tutorial on how to start with tumblr. But here you are on dreamwidth/livejournal, and while even Facebook and Instragram (and I believe, also Pinterest) have a lot of Arashi fans (also a lot discuss in LINE groups), this is where the real business is happening because mainly here will you find subs! nicefinalbeam made an awesome tutorial for Livejournal, so I highly suggest you read it carefully because there are many unspoken rules in this fandom that you should be aware of. You also should know that, since the new TOS of Livejournal, a lot of people and communities are migrating to Dreamwidth, it's basically a clone of Livejournal, so the same etiquette should be applied there as well. If you want to try your hand at Dreamwidth, I highly suggest that you read this tutorial by coolohoh. 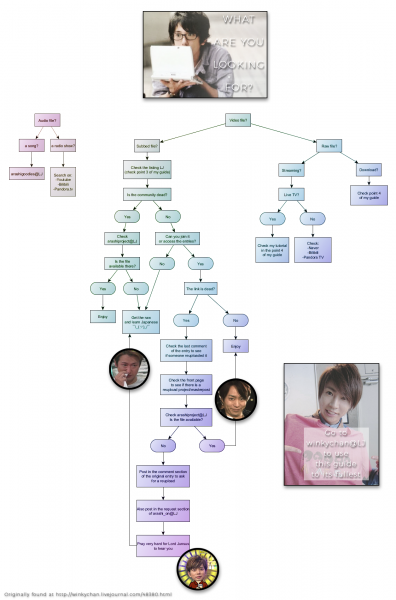 I've made a big flowchart at the end with the tried-and-tested process to find almost every Arashi file you may need to find. First, you want to know what you're looking for. For many files, you will need to search sometimes in Japanese, sometimes in Korean, so you should refer to this guide I made. You will also need sometimes, somewhere, to type in Japanese, so please follow this tutorial on how to install the Japanese keyboard on your computer. If you're looking for a video where you only have a gif or a picture, and if you cannot get informations from what could be written on the picture, try using Google reverse image search (here's a tutorial). If you ever need to request something, you should do it here at arashi_on but please be careful to read the rules first and be mindful on how you do it or you will get banned. Once again, please read nicefinalbeam 's guide to Livejournal to know the proper etiquette to adopt. I highly highly highly recommend that you get Jdownloader 2, because it will simplify your life immensely. It's a download manager, that support almost every plateforms, it will unzip your file, join them, manage their passwords etc... it's just that amazing and time saving! Here is a very simple tutorial. Jdownloader will deal with the 5 points below, it is THAT amazing! You will maybe later need Clubbox and/or Baidu, but we'll get to this part later. I recommend that you update all your video codecs using K-lite codec pack. Also I recommend the use of VLC as your video player. And here is a tutorial on how to add subtitles to a video using VLC (this will only work with softsubs, most usually you will get them for dramas and movies, the subtitles are in a separate file and not directly on the video). There are great listings of subbed files around, so I'll list them all here. Just know that you will encounter MANY locked entries and unfortunately behind that, EVEN MORE dead links (because of the great Megaupload tragedy). I highly recommend, if you have not done it yet, that you really read nicefinalbeam 's guide to Livejournal because it covers that aspect. There are other LJ communities for raws that are really up to date but they don't allow to link back to them. I suggest you look for the raw provider credit on subbed files and errr.... ask your friends for "KnH" and "DSS". Pan.baidu is a Chinese online cloud storage and is the number one raw provider for Arashi stuff. You can read my tutorial to learn how to use it. Clubbox is a Korean online cloud storage, really slow, but also a great source and easier to find stuff (especially old) than baidu. You can read my tutorial to learn how to use it. Naver is a Korean social plateform where you will be able to stream almost every video you want. Here is a great tutorial by shelketuesti. Bilibili is a Chinese video streaming site. Youku is a Chinese video streaming site. Tudou is a Chinese video streaming site. Works better if you've read the 4 points above or else you will feel lost! Also feel free to make suggestions in the comments to complete this guide! You know, I've been in this fandom for more than 10 years, but I had a 5 years hiatus and it was sooooo difficult and confusing when I came back, that I really felt the need to do this (I first complete other tutorials first so they could be linked here). This page was loaded Apr 23rd 2019, 6:09 pm GMT.